The eyes, among our most important external organs, are also among our most vulnerable. Besides the risk of discomfort, long-term eye injuries can occur if appropriate eye safety measures are not taken. Taking a few eye safety precautions in everyday life can dramatically decrease the risk of eye problems and injuries. • Always handle sharp objects, including knives, scissors, and even pencils, with extreme care. And do not allow small children to have access to them. • When surfing the internet or using the computer for any lengthy period of time, be sure to blink plenty and look away from the screen periodically. • Sunglasses are crucial for preventing long-term sun damage to the eyes. Be sure to select and wear those that block ultraviolet radiation from the sun. 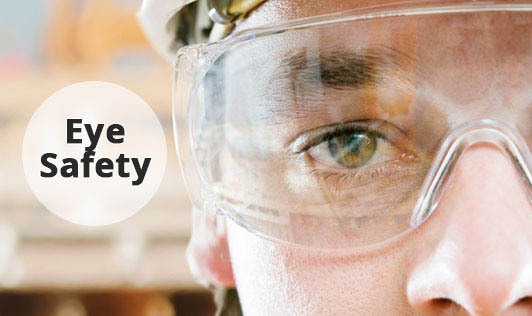 • Always wear proper eye protection, taking special care when working with chemicals or power tools or engaging in hobbies involving small pieces of material. • Wash your hands after using any chemicals so that you do not accidentally rub them into your eyes. Babies don't produce tears in their eyes until they are one to three months old.